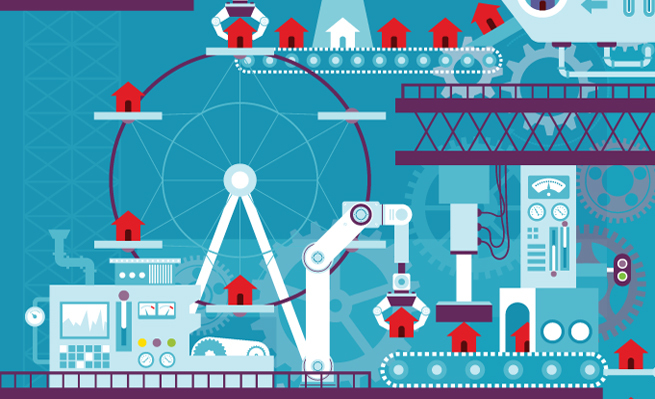 Operational success for manufacturing companies and retailers is highly dependent on inventory—having the right inventory at the right place at the right time. Whether raw materials, finished product, or storeroom parts, tightly managing inventory is critical to a company’s success. 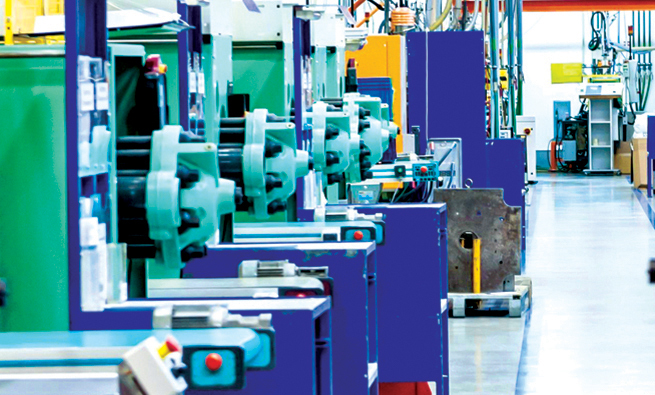 If you work for a manufacturer, obviously it’s imperative to keep your production lines running. To do so, it’s critical to have all the right raw materials available for the product that’s scheduled to run. Production will stop if you’re missing or run out of even one ingredient, such as a spice. And if there’s an equipment failure, it’s imperative to have the right spare parts available in the storeroom to fix the issue quickly. Otherwise, you may face significant downtime and loss. Whether your company is a manufacturer or a retailer, having accurate inventory also helps you avoid inventory write-off, ensuring that aging inventory is addressed before expiration or obsolescence, and saves you space and money. Imagine if your largest customer places a significant order but the inventory system doesn’t accurately reflect these items as being in stock. To fill the order, you’ll likely add the products to your manufacturing schedule, which will result in excess inventory and the related storage requirements and cost. 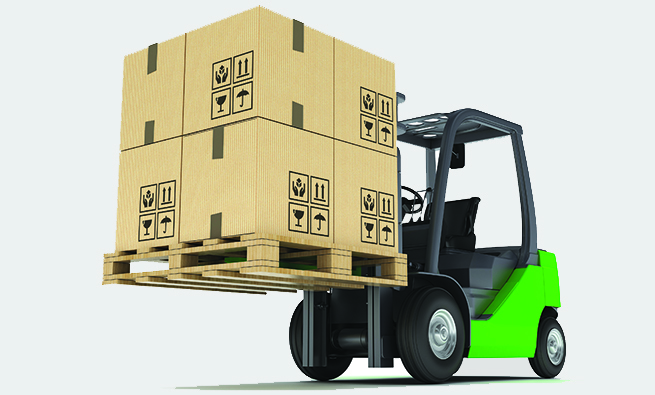 Accurate inventory also ensures accurate reporting and enables you to make better decisions. If you build inventory in advance of a shutdown or as you prepare for a busy season, you may need to leverage one or more third-party warehouses for storing the overflow. Appropriate insight into your actual inventory will allow you to make an informed decision on when to first use a new overflow warehouse. This is especially important if you’re building a minimum usage requirement into the third-party warehouse agreement. What’s most important is that effective inventory management allows you to consistently deliver a high level of customer service, which will keep your customers smiling. Yet managing inventories effectively and efficiently can be challenging since there are so many moving parts, both inside and outside your organization. And the complexity increases exponentially when dealing with a large number of geographically diverse locations, especially when third-party warehouse partners are in the mix. Now I’ll share my recollection of one team’s journey in creating an Inventory Control Center of Excellence (COE) that ultimately encompassed a network of more than 50 warehouse, co-manufacturer, and repacker locations. This journey resulted in reduced costs as well as enhanced inventory management and control, the proverbial win/win. One of my first memories after becoming the finance leader for an iconic consumer product manufacturing and distribution facility based in Northwest Ohio is of observing the site’s annual finished product wall-to-wall physical inventory. What a sight to see! The Finance Inventory Control manager led a team of approximately 150 cross-functional associates as they counted nearly 10 million cases of product over a long weekend. Amazingly, the result was minimal differences and kudos from the external auditor who was on-site throughout the counts. While this finished product represented the team’s largest and most complex inventory, I quickly learned that it wasn’t the team’s only inventory. The team, of course, also had oversight of on-site raw material and storeroom parts inventory. In addition, it was accountable for inventory at 25 or so third-party warehouse, co-manufacturer, and repacker locations. Several of these locations represented local raw material and finished product overflow warehouses for the operation. Others were central raw material storage sites that the team managed on behalf of the company’s North America Supply Chain network. Finally, the team managed a series of warehouses that store frozen finished product for the company’s food service business. Soon after I arrived at the site, we implemented SAP in conjunction with the company’s enterprise-wide rollout. The Northwest Ohio site was the last of the company’s thermal operations in North America to “go live,” which was intentional. As the largest operation, we were able to help the other sites overcome customer service challenges as they worked through the typical SAP start-up curve. But our local team had no such luxury. As the single source of several key product lines, we couldn’t afford to stumble. The timing of the site’s SAP implementation allowed the corporate SAP project team to resolve numerous issues before going live with SAP for our operations. This timing also enabled the team to partner with colleagues at the other thermal operations—in general and specific to inventory control—thereby reducing local SAP learning curves. Even though our Finance Inventory Control Team leveraged lessons it learned from sister operations, it quickly faced issues new to the network because of the variety, complexity, and extensive activity of the third-party warehouses it managed. For example, as previously noted, this team was uniquely accountable for central raw material storage and frozen-related third-party warehouses. Through complete engagement—meaning deep focus and attention to detail—and a positive “can do” attitude, the team quickly worked through these challenges and began developing inventory control expertise within the SAP environment. In addition, each member of the Finance Inventory Control Team was intentionally cross-trained. This way, those accountable for raw materials inventory could support those accountable for finished product and/or storeroom inventory and vice versa. The team quickly earned the reputation of being the North America division’s inventory control subject matter experts (SMEs). Thus, when a sister site unexpectedly found itself in need of inventory control support, the Ohio-based team was called into action. Specifically, our sister operation’s controller asked if we could “loan” an inventory control resource to them for several weeks. But sending a member of the team to another location for a month wasn’t a practical idea. Instead, I suggested that we try to support their third-party warehouse inventory control activities from Ohio, leveraging the technology offered by SAP as well as the “power” of our entire Finance Inventory Control Team vs. physically providing them an individual team member. This approach worked so well that another location asked if the team could provide similar support when their inventory control resource took a leave of absence. Again, the approach was a great success. And an idea was born. 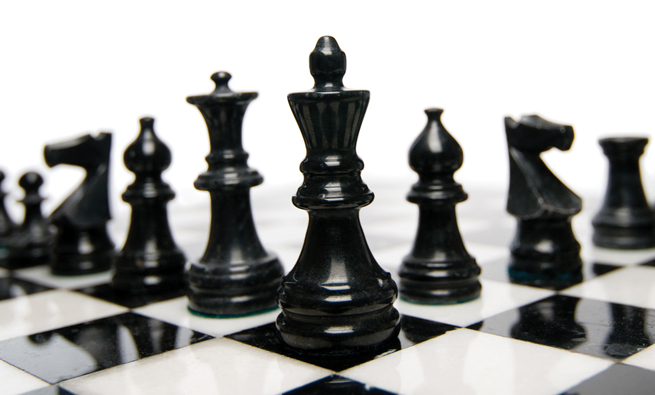 Articulating the vision for an Inventory Control Center of Excellence was the easy part. Determining how to bring our vision to life was the greater challenge. When the company originally implemented SAP, each North America operation had accountability for executing its own inventory management and control activities, subject to overall corporate policy and procedures. In some cases, such as the Northwest Ohio operations, the local Finance team was accountable for inventory control. In other cases, Planning, Receiving, Warehousing, Production, and/or another local function was accountable. 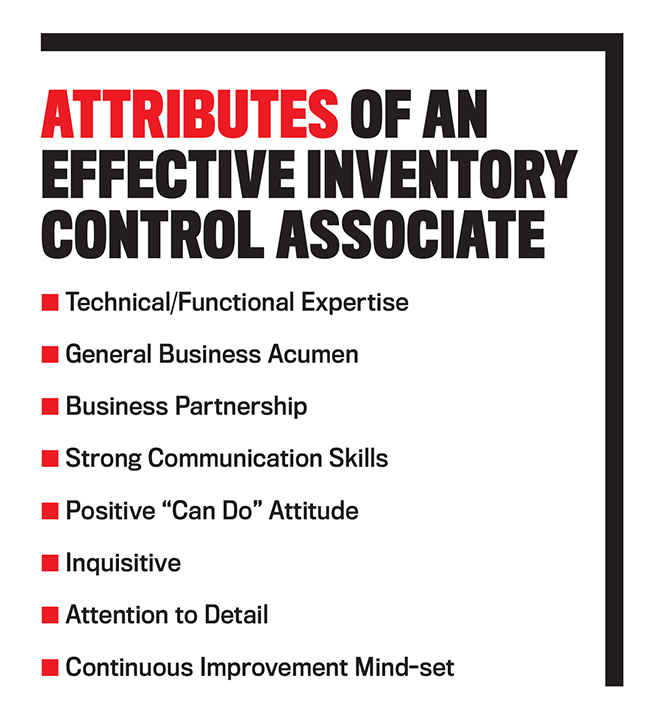 Inventory control activities were decentralized, allowing each operation to adopt its own approach to inventory control. 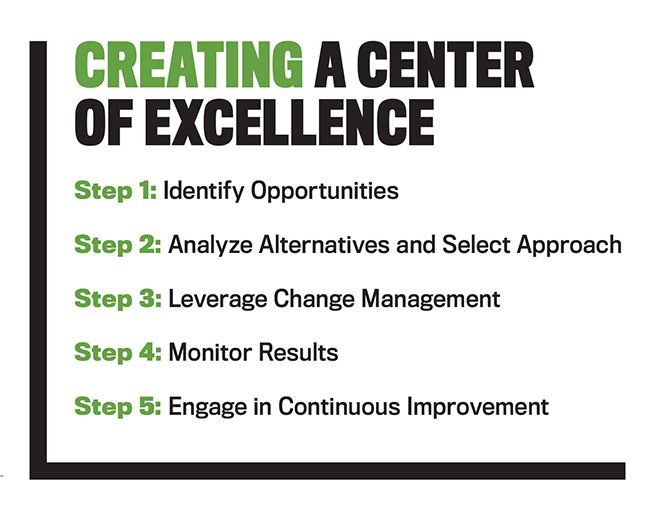 The term “center of excellence” can be interpreted various ways. For us to realize our vision could be as simple as offering the Ohio-based Finance Inventory Control Team as a resource to the other sites in the network. The team could be the official “go to” subject matter experts for inventory control questions and support. 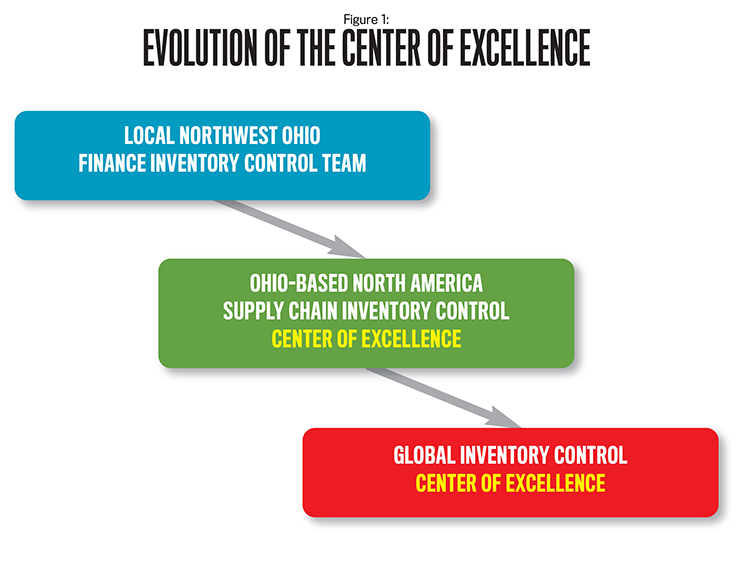 At the other extreme, creating an Inventory Control Center of Excellence could imply centralizing inventory control activities within the Ohio-based team and redesigning the supply chain organization accordingly. Hosting monthly network inventory management and control calls to provide a forum for issue resolution and troubleshooting, share inventory control best practices, and invite guest speakers to discuss topics of interest. Driving standardization of inventory control policies, procedures, and work activities. Enhancing existing reports, creating new reports, and driving inventory-reporting standardization across the network. Eliminating inconsistent reporting structures and ensuring local Finance oversight of inventory control activities across the network. Leveraging the Ohio-based team to facilitate selection and setup of new warehouse partners across the network, ensuring new partners are properly vetted and new warehouse setup is standardized. Assigning the Ohio-based team a formal oversight role regarding local inventory control specialists across the network and/or centralizing outright the inventory control function in Ohio. Again, the journey to establish an Inventory Control Center of Excellence really began when we created the Finance Inventory Control Team. The individuals doing inventory control type work were all part of the local Finance team, but not all were part of one subteam. Rather, I had three teams reporting directly or indirectly to me: the raw materials team, the retail finished product team, and the frozen finished product team in conjunction with the site’s SAP implementation. Philosophically, the corporate SAP team encouraged local management across the network to ensure a segregation of those with SAP Make-to-Ship (operational) and SAP Account-to-Report (financial) roles. One way to accomplish this segregation was to assign inventory control personnel to a function other than Finance. 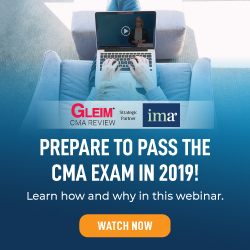 This approach wasn’t feasible in Ohio, though, because the Ohio-based Finance associates were accountable for a network of 25 or so third-party warehouses, co-packers, and repackers beyond the scope of local operations management. As such, we created the Ohio-based Finance Inventory Control Team, a part of the site’s overall Finance team, but only assigned members of this team transactional SAP Make-to-Ship security rights. In addition to supporting on-site operational personnel in managing internal raw material, finished product, and storeroom inventories, this new team was created to directly manage overflow, food service, and other third-party warehouses, co-packers, and repackers. The team was initially divided into three subteams: Raw Materials Inventory Control Team, Retail Finished Product Inventory Control Team, and Food Service Inventory Control Team, respectively, under the leadership of the newly created position of Finance Inventory Control manager. Members of the Ohio-based Finance Inventory Control Team were directly involved in all aspects of inventory control, including daily controls, monthly reconciliations, cycle count audits, physical inventories, new warehouse setup, storeroom, and other activities. We also required each member of the team to cross-train, thereby becoming effective backups to one another. And we created various reports to help monitor the team’s performance and benchmark against the other operations. In the end, the Ohio-based team quickly became known as the network’s inventory management and control SMEs. The North America Supply Chain Inventory Control Center of Excellence was born! When we initially declared our vision for the COE, we expected to realize this vision by simply offering the Ohio-based Finance Inventory Control Team as a resource to the other sites. To that end, the team initiated and began chairing monthly network conference calls for all inventory control personnel and other interested parties. The team also began sharing locally developed benchmarking reports, including an aging and overage finished product report with drill-down capability. And the team continued to support sister operations with the setup of new third-party warehouses, physical inventories, special projects, and even day-to-day backup on request. Our vision for the COE changed when a smaller site requested the team to assume outright inventory control responsibility for its third-party warehouse. Having successfully supported this site for an extended period the prior year, the team members were confident they could do so ongoing. We ensured alignment of expectations, captured via an informal memorandum of understanding, and then began performing this service for them. Then the other operation the team had been supporting, still struggling with resource needs and a challenging third-party warehouse network, asked if the team could assume a permanent support role for them as well. We agreed, but, while working through the planning phase of the transition, yet another operation contacted the team for support. Specifically, one of this new site’s two inventory control associates announced her retirement with short notice, so the site’s controller was hoping the Ohio-based Inventory Control Team could cover the gap. Within a few short years, the Ohio-based Finance Inventory Control Team evolved from being the network’s inventory control subject matter experts to being the North America Supply Chain Inventory Control COE, centralized in Ohio. The Ohio-based North America Supply Chain Inventory Control COE Team ultimately managed a network of more than 50 warehouse locations, which is more than double the number of warehouses it managed when the journey began. By all accounts, the team steadily improved the efficiency and effectiveness of managing raw material and finished product inventories throughout the network. And it enhanced the related controls over inventory management, especially in regard to third-party warehouse partners, such as driving consistent contract language for third-party warehouse physical inventory requirements. Moreover, this initiative delivered significant annual savings throughout the network. So the team’s journey, as they say, resulted in the proverbial win/win. 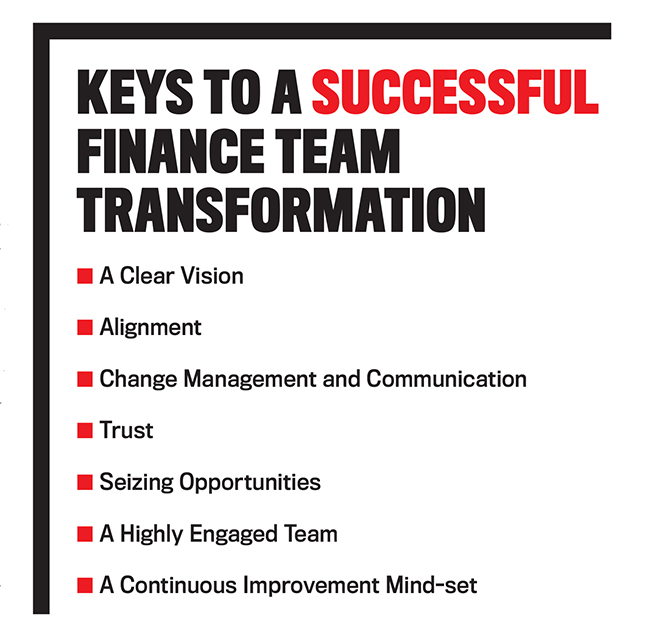 Seven key factors contributed to the team’s success and, indeed, will increase the probability of success for any finance team transformation (see sidebar above). Key No. 1. The first key to success was defining a clear vision and goals, then allowing them to evolve over time, seizing unexpected opportunities as they presented themselves along the way. Initially, the local Finance Inventory Control Team associates focused on developing their personal expertise using the new SAP tools, then on being able to effectively back up one another. The team’s collective goal evolved into being the network’s strongest inventory control team, assuming a leadership role among peers at the sister sites. Ultimately, we declared that our vision for the team was for them to “achieve ‘best in class’ inventory management and control via creation of the North America Supply Chain Inventory Control Center of Excellence.” Now referred to as the company’s Global Inventory Control COE Team, they have been making the vision a reality ever since. Key No. 2. The second key to success was alignment within the team, across the site, throughout the network, and with senior management. The new Finance Inventory Control Team in Northwest Ohio was created in conjunction with the rollout of SAP, so each associate needed to understand his or her new roles and responsibilities. Likewise, the team’s local cross-functional partners also needed to understand and embrace SAP-driven changes. For example, pre-SAP, the Finance team ensured inventory accuracy via various daily/weekly/monthly controls and by conducting annual wall-to-wall physical inventories. 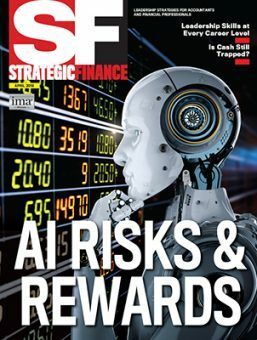 Post-SAP, however, operations personnel assumed direct responsibility for executing ongoing cycle counts of internal inventory while the Finance team assumed an oversight role. As the team began backing up sister sites, team members had to ensure their counterparts at the other sites were aligned on expectations, and they had to build relationships with management at the related third-party warehouses. Finally, and most importantly, before permanently centralizing work in Ohio, it was absolutely critical for me to ensure senior management approved. Key No. 3. Many people are comfortable with the status quo, so changing expectations and responsibilities can be a source of stress. Starting with the overall SAP implementation and continuing as the Ohio-based Finance Inventory Control Team evolved into the company’s North America Supply Chain Inventory Control COE and ultimately into the Global Inventory Control COE, there was constant change. Thus, effective change management and communication was the third key to success. To begin, the local Inventory Control manager and I clearly defined our vision for the team to become “best in class,” frequently reinforcing this message in team meetings and during one-on-one discussions. We ensured each member of the team had clear goals and objectives, such as taking on a new third-party warehouse partner, defining a new process, or hosting a network call, and held each member accountable accordingly. We redesigned the team structure and redefined job descriptions as the nature and scope of the team’s collective responsibility evolved—for example, consolidating all retail and food service finished-product warehouses under one supervisor. We leveraged the team’s expertise to make key decisions, ensuring team members’ engagement throughout the transition and ownership of the outcomes. Finally, we encouraged the team to raise concerns early and celebrate successes often. Key No. 4. Trust was the fourth key ingredient to our success. By defining a clear vision, leveraging an effective change management and communication plan, encouraging frequent and open discussions, and providing team-building opportunities, we created a “high-trust” environment. As a result, members of the team backed up and supported one another through good times and bad. And the team trusted management to do the right thing, even when we had to make tough choices, such as restructuring the team and changing job responsibilities. Key No. 5. While you can define a vision and create a plan, sometimes you simply need to seize the opportunities that present themselves along the way, which is the fifth key to our success. We invested significant time and effort to ensure each member of the Inventory Control Team was proficient in using SAP at go live. And we intentionally challenged each member of the team to become an effective backup for the other members of the team. So it was no surprise that when other sites in the network needed inventory control support, they requested the Ohio-based team to provide it. Though we didn’t expect to provide such support on a permanent basis, when the opportunity presented itself, the team seized it, and the vision for the Inventory Control COE was born. Key No. 6. All members of the Finance Inventory Control Team had a positive “can do” attitude. They took pride in their work. They were committed to learning their new responsibilities, becoming proficient then expert with SAP, and overcoming any obstacles in their way. They were passionate about inventory control and were willing to share their passion throughout the network. Having such a highly engaged team was the sixth key to our success. Key No. 7. Along our journey, having a continuous improvement mind-set was the seventh key to the team’s success. Some ideas, like enhancing an existing report, creating a standardized template, or tweaking a process, were relatively simple to execute. Other ideas, like creating a network-wide inventory aging report with drill-down capability, negotiating third-party warehouse agreements with more “teeth,” or improving the efficiency and accuracy of the invoice approval process, were more time-consuming. And then there was the organizational redesign of the Finance Inventory Control Team itself, which required significant time, effort, and effective change management to ensure success. The team understood that there are always opportunities to do things better and, by embracing the spirit of continuous improvement, made a difference each and every day. This article reflects one team’s journey in creating an Inventory Control Center of Excellence with accountability for a network of more than 50 warehouse, co-manufacturer, and repacker locations. Creation of this COE enhanced inventory control while reducing related costs, the proverbial win/win. If your organization also has a large, complex network of warehouses, you should consider if it would be beneficial to create your own Inventory Control COE. What’s more important is that, beyond the inventory control theme, many companies now operate in an extremely competitive and cost-conscious environment. Expectations of the Finance team are changing daily. As Finance leaders, we must transform our teams to become more effective business partners as you saw in a few examples here. 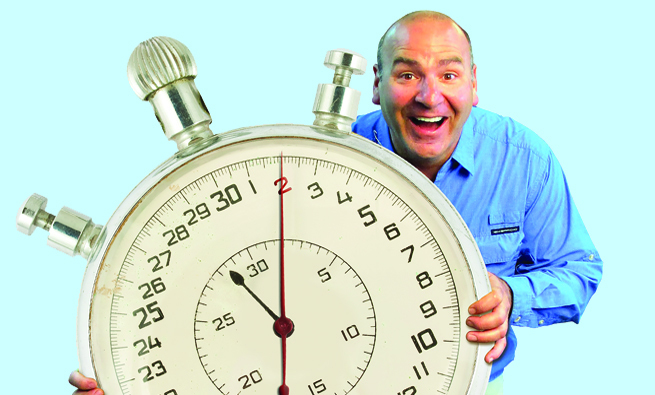 Are you feeling this pressure? If so, proactively seek ways to enhance your team’s efficiency and effectiveness, increase your team’s capacity, improve your team’s insights, and strengthen your team’s controls. Always have a continuous improvement mind-set so you can ensure that continuous improvement becomes part of your and your team’s collective makeup. Finally, be on the lookout for and seize the unexpected opportunities that present themselves along the way.